CS Resource Tycoon: New Hero Genesis Shows Up! Is there a hero who can both heal the paty members and damage enemies? Is there a hero who can cast the regular skill without costing any rage? Is there a hero who has the previlege to have halo skills as angels? Yes, there is! Genesis, who can meet all of the requirements, will show up in CS Resource Tycoon! And good news is that, the first 3 winners in the overall ranking will all be able to take the hero into their squad, and the 4th to 6th players will have the honor to take Skeleton Devotee! Players can exchange for their beloved heroes and exclusive amulets freely during the event! From Feb. 21st to Feb. 26th(server time), you can gain points by collecting required resources during the event, , i.e. Enchanted Ore, Spring of Wisdom, Spirit Essence, Magic Mount Soul, Ascension Stone, Runestone, Awakening Stone, Element Crystal, Angel Tears, Aegis Shard, Blessed Stone, Soulstone, Gem Enhancement Stone, Gems and Grotto Heart. Note: Gain Magic Mount Soul and Element Crystal for 2X points, Aegis Shard for 3X points! 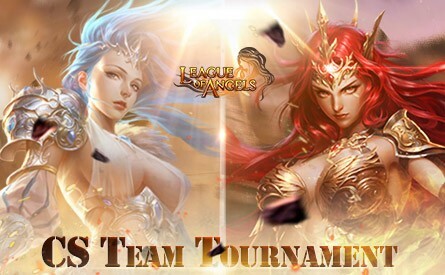 The CS Team Tournament starts on Feb. 21st! Team up with your friends and fight for glory! Titan Warlord's arrival makes Earthshaker the first hero to get a 3rd evolution! How will you arrange the formation if you (or your opponent ) have Titan Warlord in the party? Share your ideas on the Fanpage before Feb. 22nd(EST) to win FREE DIAMONDS and valuable tokens! Click GO now! In addition, if you want to gain more resources for the tycoon, don't forget to check out Djinni's Merchant(2/21-2/23), Navigation King(2/21-2/24), Lucky Tree(2/24-2/26) and Fortune Bag(2/24-2/26). Event Bonus will be available on Feb. 21st, Feb. 24th and Feb.26th where you can gain tokens for different events. P.S. : Special thanks go to Missiry(S560) for making the awesome fan art! Please note that the above content might be adjusted due to changes of the development plan. Final updates will be determined in game. More exciting events are coming up through Feb. 21st to Feb. 28th (server time), check them out in the in-game Hot Events menu now! Last: SS Resource Tycoon: New Angel Monica Descends! Next: Happy Valentine's Day: Enjoy the Company of League of Angels!